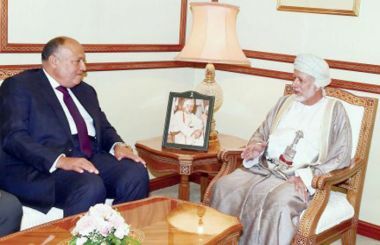 MUSCAT: The Oman-Egypt Joint Committee on Tuesday held its fourteenth session, which is being hosted by the Sultanate. The two-day session is headed by Yusuf bin Alawi bin Abdallah, Minister Responsible for Foreign Affairs, from the Omani side and the Egyptian side was headed by Sameh Shoukri, Minister of Foreign Affairs in Egypt. During the meeting, the two sides reviewed the existing bilateral cooperation, and expressed satisfaction with the level of relations supported by the leadership of the two brotherly countries, under the wise leadership of His Majesty Sultan Qaboos and Abdel Fattah al Sisi. During his to the Sultanate, Sisi had affirmed the importance of moving forward to enhancing bilateral cooperation in all political, economic, commercial, industrial, judicial and developmental fields, to achieve the aspirations and the hopes of the two countries. The two sides reaffirmed their commitment to the joint Arab action based on cooperation, integration, mutual respect and good-neighbourliness aimed at consolidating the foundations of stability and lasting development in the Arab region, expressing their solidarity with the just Arab issues and standing against all attempts to undermine the national sovereignty and the unity and security of Arab countries. The Egyptian side noted the role played by the Sultanate under the leadership of His Majesty to establish security and peace in its regional and international environment. For his part, the Omani side valued the leading role played by Egypt under the wise leadership of President Sisi, with the aim of establishing security and stability at regional and international levels, and the efforts of the president to establish peace, security and development in the African continent. The two sides affirmed their rejection of extremism and terrorism in all its forms, whatever its justifications, motives and means, and on the importance of regional and international efforts to confront the phenomenon of terrorism, eradicate it and eliminate its causes, while calling for strengthening the channels of dialogue between countries and peoples. The two sides signed memoranda of understanding and programmes of implementation in various fields between the ministries of health of the two countries and an executive programme between the ministries of environment and climate affairs in the two countries for the years 2019-2020, stressing the importance of continuing and strengthening cooperation and activating them. 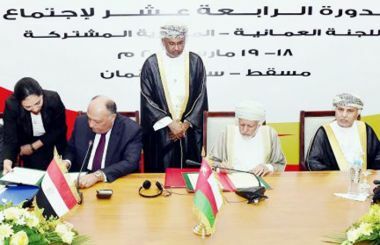 The two sides also signed an executive programme between the Ministry of Education in Oman and the Ministry of Education of Egypt (2019-2021), as well as an executive programme between the Ministries of Manpower of the two countries (for the years 2019-2020) and a programme of cooperation in the field of standards, compliance with non-food industrial goods between the Sultanate and Egypt.